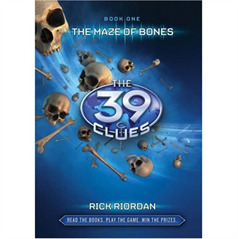 The 39 Clues books set the story, and the cards, website and game allow kids to participate in it. Kids visit the website - the39clues.com - and discover they are lost members of the Cahill family. They set up online accounts where they can compete against other kids and against Cahill characters to find all 39 clues. Through the website, kids can track their points and clues, manage their card collections, dig through the Cahill archives for secrets, and "travel" the world to collect Cahill artifacts, interview characters, and hunt down clues. Collecting cards helps: Each card is a piece of evidence containing information on a Cahill, a clue, or a family secret. Every kid is a winner - we'll give away prizes through the books, the website and the cards, including a grand prize of $10,000!